I didn’t feel too jetlagged, so after securing some WiFi and checking in with my family via Skype, I decided to take to the Taipei streets and seek out some lunch and temporary groceries, like fruit or snacks, to keep me on the right side of hunger and foreign-country-distress. I scouted my walking route around the “Da An” district of Taipei (大安) using Lonely Planet Taiwan, the enormous Taipei tourist map from Fulbright Taiwan, and Google Maps. I decided to head to a restaurant called “Sweet Dynasty” and then to an organic grocery market called “Santa Cruz,” and see what I could find along the way. 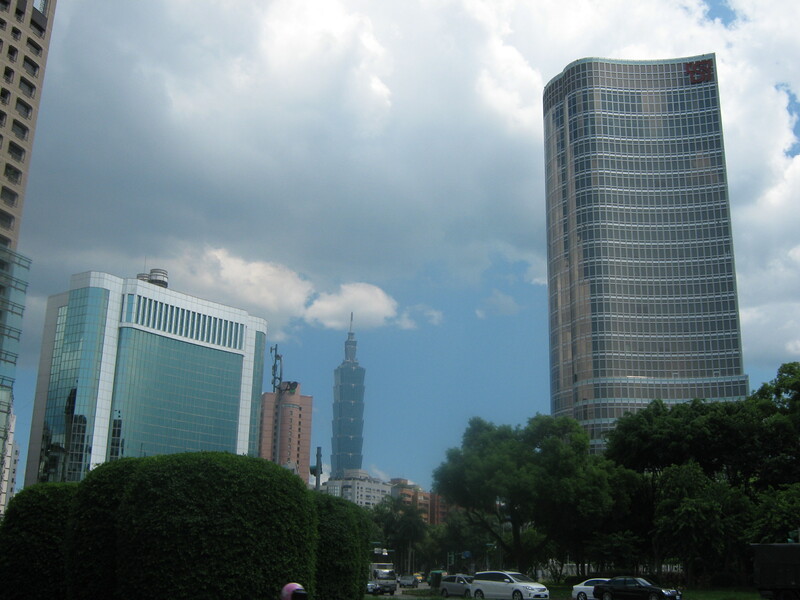 – And, most embarrassingly, a guy with a hand truck stacked high with cardboard boxes, and I didn’t see him because I was taking a picture of the Taipei 101 building and the skyline at the rotary. The product of my high-risk attempt at photography. It was the perfect way to get settled: have some comfort food and sit down in a restaurant with a book, after a long plane ride and some edible but not particularly satisfying airplane meals and snacks. 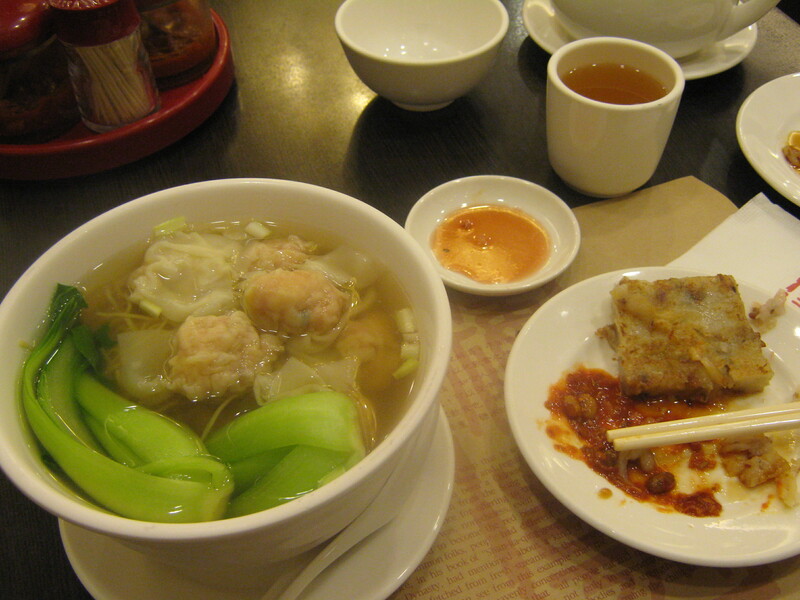 The won ton soup was beautiful– it had tender shrimp-filled won tons in perfectly thin skins, silky egg noodles, and fresh baby bok choy. And the turnip cake was tasty– not as greasy as the ones I’ve had in the US, and the shreds of turnip in it actually tasted sweet. Red bean Tong Shui and infomercial place mat. She pointed me towards a red bean, taro, and coconut milk soup, which eagerly ordered– I’m a big fan of red bean flavor. 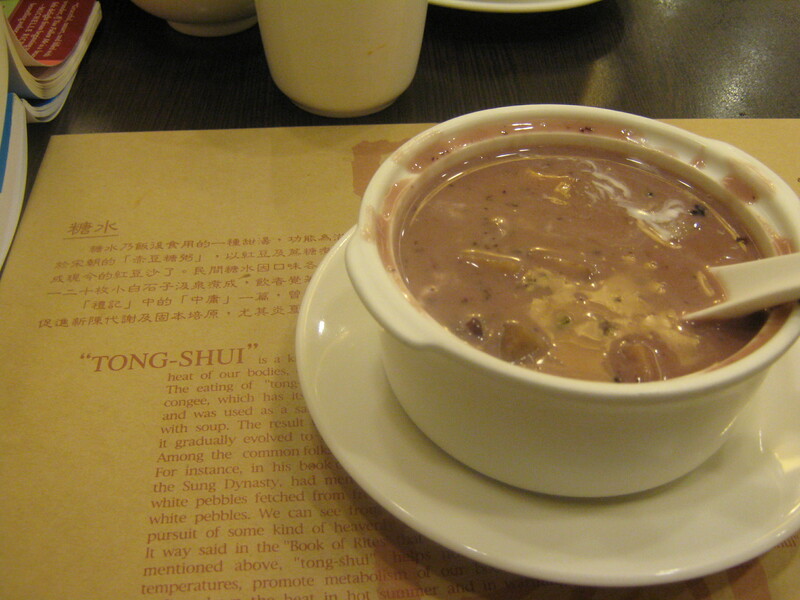 The taro was in starchy blocks, like potato in New England clam chowder, and the beans were all crushed up, but the soup was creamy and just sweet enough without being cloying. And as I ate, the flavors and gentle warmth of it grew on me– I couldn’t stop eating it! I finished and managed to ask for my bill and the directions of the restrooms in Chinese. Whew. I can already feel the medicinal effects of the Tong Shui– my jet lag is quickly being replaced by a sense of mastery over my surroundings! And then I stepped out onto the sidewalk and was almost hit by another scooter. Thanks to everyone for your well wishes in getting me here! 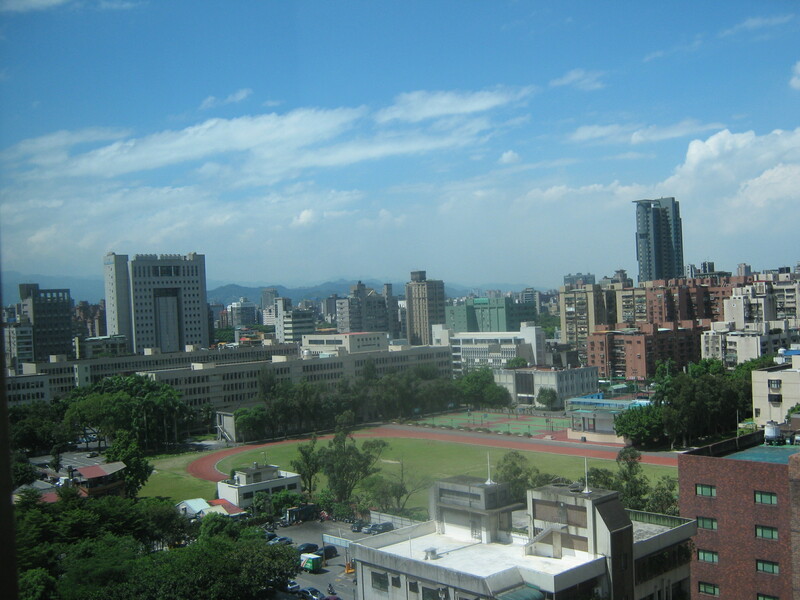 More coming soon, on Travel Fashion, neighborhoods in Taipei, and going to my first Night Market. 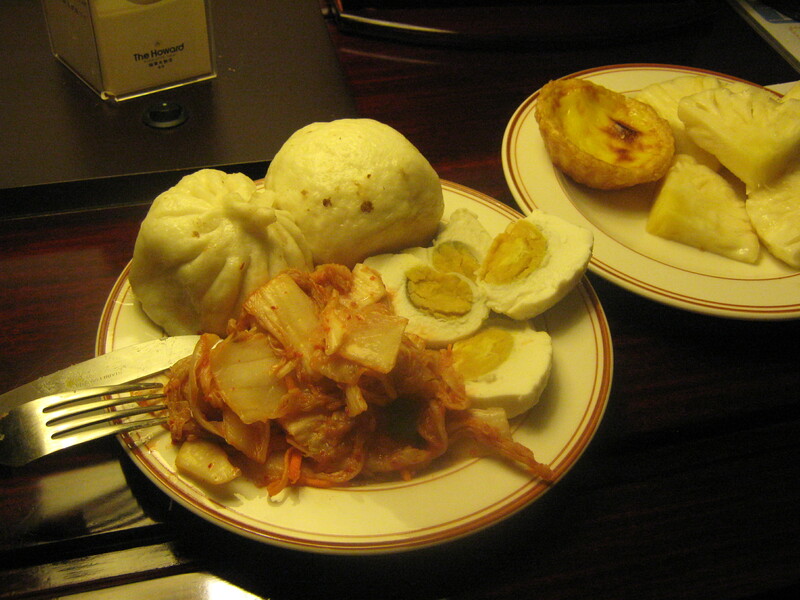 I had dinner in my hotel room with the fruits of discoveries: meat & vegetable bao, kimchi, salted duck eggs, with egg custard and pineapple for dessert. Yum! 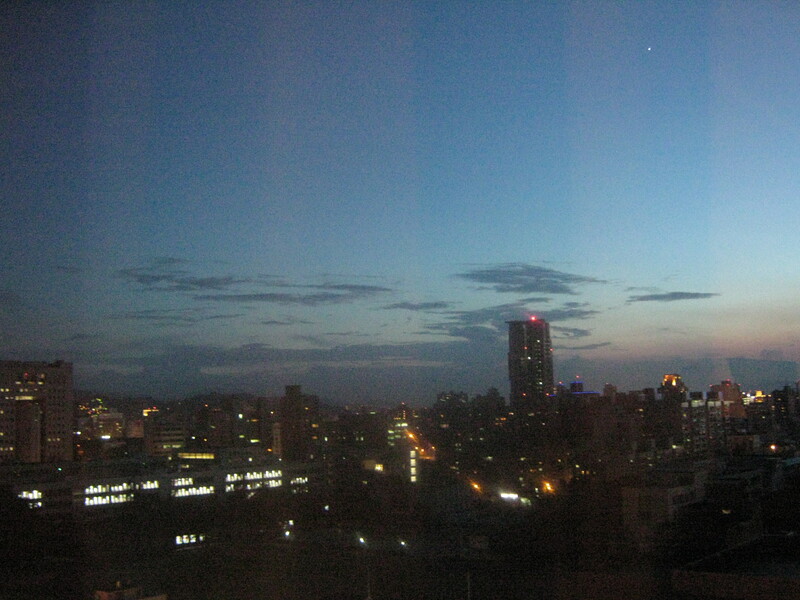 My view is also quite nice at night. Very "Lost in Translation," I think. I’m happy you arrived safely! Also, that food looks delicious–I’m glad it’s not too overwhelming or weird. It sounds like you’re getting the lay of the land, but try to be more careful of those scooters. This is the best blog ever! A perfect mix of all the wonderful cultural and self discoveries of traveling. I miss you tons though, you eloquent lady! Thanks, ladies!! And a good update: Day 2 was far less dangerous, traffic-wise. Guess I’ll have to put my Boston days of jay walking and other flagrant pedestrian behavior behind me! 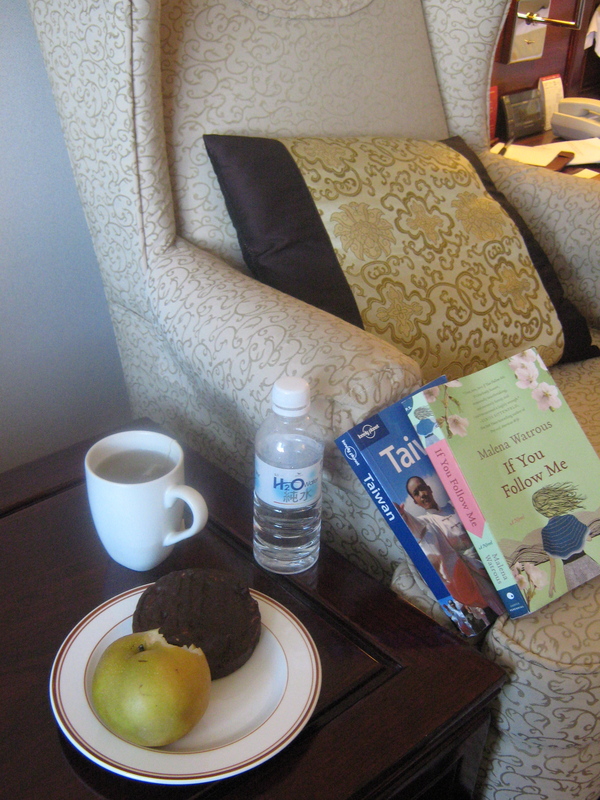 I enjoy the books artfully arranged by the food in the “at home” photo.